Have you mastered stage 1? Have you ever been to a professional development session that looks like this? Okay, maybe it’s not that extreme. But often times adults make for much worse students than kids do! They grade papers or send emails instead of listening to the speaker. They raise complaints to “shoot down” whatever the presenter is talking about. They simply zone out and wait for it to be over. We’ve all been there — its 4pm, you’re tired, and this meeting seems useless. The problem is we can’t transform our schools or achieve dramatically different results with our students unless the adult culture is one of learning and energetic collaboration. In yesterday’s post we talked about teacher evaluations in the first installment of our trending series. Today, let’s take a look at some of the big ideas and principles of stage 1 of our framework: adult learning. Below you’ll find a self-evaluation and reflection tool you can use to check in on your own progress. 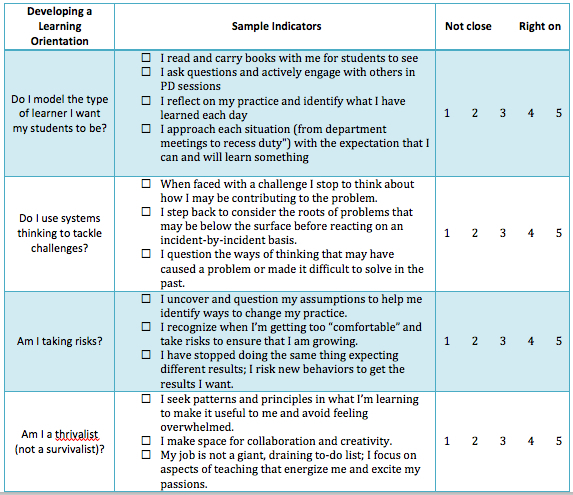 Have you developed a learning orientation? Are you building the habits we need to transform our schools? Check in on yourself — where do you fall on this stage 1 spectrum? Set a small goal for the rest of this week. What can you do to push yourself to be the type of educator you want to be? Next postDo you model life-long learning?